Description: Central NY RHS E8s 808 and 807 powered the north end of a trip that ran for the Broome County Fair if I recall. NYSW 142 was on the south end of the train. 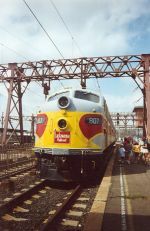 Description: There were plenty of other excursions for the Convention, of course, including this one on the Finger Lakes Railway from Syracuse to Auburn, NY, pictured here. 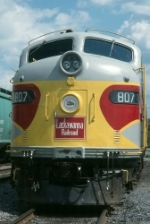 Power was provided by the Finger Lakes Railway, NYS&W, and the Central New York Chapter, who provided this EMD E8. #807 is one of two that they have, the other one being #808, which was restored earlier. Description: Sitting at the NY State Fair. To its left (fireman's) side are its brother, DLW 808 and PRR GG1 4933. To its right is the CSX Chicago Line, and behind it is a string of about a dozen heavyweights. Yes, that is a blimp balloon. 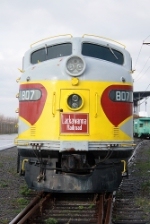 Description: Built in 1952 as PRR 5761, this locomotive was acquired by the CNY Chapter from the Green Mountain Railroad as part of an equipment trade. Description: On static display at the NYS Fairgrounds, Syracuse, NY. Title: DLW 807 is quite recent by comparison. Description: This number was not on the DLW roster. Former PRR 5761, MBTA 4261. Description: I got an email that CSX K248-17 was on the Belle Isle Siding. I drove by and took this picture. The train left the siding early the next morning and headed north on the CSX St. Lawrence Subdivision to the port in Ogdensburg, NY.